Not long ago on a warm sunny morning, a bunch of us intrepid study group members embarked on a short voyage to Onrust Island, not too far from Jakarta, amidst the Thousand Islands. The modern history of Onrust goes back to the 17th century, when the Dutch obtained permission to set up a storage facility to promote trade between the spice islands and Europe. Like a good greedy colonial power, they then proceeded to establish their supremacy over the archipelago, but that’s another history lesson. Since 1615 when the island started functioning as a warehouse and defence base and later became a fort, it stayed very busy, thereby earning the name ‘Onrust’ which is Dutch for No Rest. Control of the island went back and forth with the British during the late 18th century, and the structures on the island were destroyed multiple times. There was some restoration, and after 1827, the island was developed into a floating shipyard, very busy until the Tanjong Priok harbour was built. Further, the Krakatau explosion in 1883 is said to have destroyed the structures on the island. The early 20th century saw Onrust take on the role of a quarantine station for the pilgrims returning from the Hajj, and even a prison for criminals. 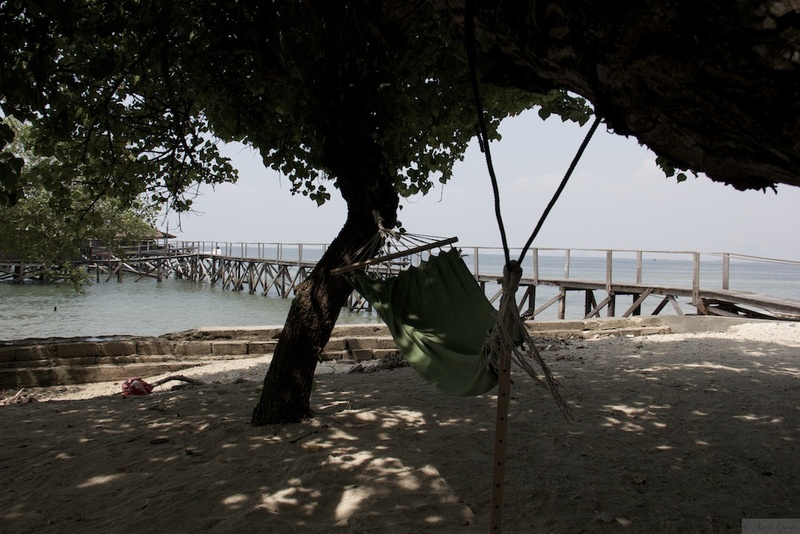 After Indonesia’s independence, the island was used as a leprosarium until 1960. Sadly today little remains of the frenetic activity on the island through 400 years. There are ruins of the sanatorium and a small museum that give some idea, but largely it seems that Onrust is finally at rest. The caretakers work at a languid pace, there are few visitors, and we probably disturbed the ecosystem of the island by our presence that day. The café on the island is ok for light refreshments but not quite lunch-worthy. Our group jetted off to the neighbouring Bidadari Island (Island of Angels) that has been developed into a resort from its more humble origins as a site of leper hospitals. The Dutch had built a fortress here which was mostly destroyed by the Krakatau eruption, and now all you can see is the base of the old tower. There’s an entrance charge if you want to set foot on the island, after which you can indulge in a number of entertainment activities (paid separately), and eat (pretty good meals). It being a week day, we didn’t come across any other tourists, only a couple of hard-working photographers on the job for pre-wedding shoots.